At a time of increasing unemployment in the face of world recession, it's interesting to reflect that until just a few years ago the concept of economy-induced redundancy was alien to most working Japanese. In this society you trained for a job, you joined a company and you generally stayed there for life. Ideally you would progress upwards within the firm, but if not then at least you had financial security. And the company would often respond to such loyalty by taking care of you. A few years ago a Japanese friend of mine was transferred to a different branch of the firm for whom he worked to one located far enough away to necessitate moving home. The company not only gave him financial assistance to do this, they helped him locate an appropriate property and delayed his transfer until he was comfortably installed in his new abode. He also assured me that if they had by some odd chance made him redundant then they would also have helped him find another job before letting him go. Pretty damned good, huh? In the late 1990s the concept of high employment and a job for life was taking something of a knock in Japan. Changing economic times saw redundancies in areas where the very idea was once unthinkable. For a nation that takes pride in its work and whose image of the patriarchal salaryman as the family wage earner is even now a surprisingly common reality, the sudden loss of position and income carries with it a degree of shame and embarrassment far beyond what we might expect to feel in the west under similar circumstances. Redundancy is not seen just as an issue of financial security, it is an affront to male authority and standing within the family and society. In the opening minutes of Kurosawa Kiyoshi's Tôkyô Sonata, administrative director and family man Ryuhei Sasaki unexpectedly and suddenly finds himself faced with this very situation when his company decides to heed the advice of visiting Chinese executive Shao Yen and outsource work to cheaper Chinese labour. Instead of breaking the news to his wife, Ryuhei carries on a pretence continued employment while searching for work elsewhere. But it's not easy to come by – unemployment is on the rise and openings at his previous salary and status are now few and far between. But Tôkyô Sonata is not specifically about unemployment or the effects of a changing economic environment on modern day Japan. Both are crucial to the film, but as story catalysts rather than central themes, indirectly triggering a breakdown of the common façade of the contented unity of the family unit. Ryuhei's family is deliberately typical in its make-up, consisting of housewife Megumi and sons Kenji and the older Takashi. There's initially little evidence of disharmony, with only Takashi's repeated absence from the meal table prompting even a hint of irritation on his father's part. But Ryuhei's redundancy serves almost as a trigger for the development and exposure of individual secrets harboured by all four family members. Kenji's confrontational relationship with his teacher is something he chooses not to reveal to his parents, a course of action he also follows when his interest in learning the piano is dismissed by Ryuhei as a passing whim. His brother, meanwhile, dispirited at the employment prospects on home turf, wants to take advantage of a new ruling that allows Japanese citizens to join the American military – as a minor he still requires the consent of his parents, but does not approach them about it until he has successfully met all other requirements for entry. Most long-standing is Megumi's buried unhappiness with her daily existence, poignantly revealed when her husband arrives home late one night and heads straight to bed, all but ignoring his wife lying sleepily on the sofa and not hearing her request to be helped up. As Ryuhei exits the room, Megumi remains, arms outstretched for assistance, and mutters despairingly to no-one in particular, "Someone, please help me up." The emergence of these personal secrets may seem coincidental to Ryuhei's misfortune, but all are at least indirectly related to the frustration he suffers as a result, as he re-enforces his patriarchal authority at home in an increasingly ineffective attempt to compensate for the social emasculation of redundancy and the indignity of the cleaning job he is eventually forced to accept. His angry refusal of the requests of both sons to explore paths that could shape their respective futures cuts little ice with either – Takashi directly challenges his position as family protector and leaves home to seek alternative military entry approval, while Kenji uses his lunch money to furtively pay for piano lessons, and later throws the broken keyboard he uses for practice defiantly at his father's feet. In spite of this, it's disarmingly easy to sympathise with Ryuhei's situation. His long wait in line at the job centre for a meagre selection of uninspiring posts will strike an empathic chord with anyone who's ever spent more than a few weeks out of work, and you can't help share his explosive frustration following his humiliation at an interview for an executive position conducted by a cocky upstart half his age. I can't be the only one who breathed a sigh of relief when the film cuts to the interview's aftermath just before we are subjected to its most seat-grindingly embarrassing moment. The friendship Ryuhei strikes up with fellow out-of-work executive and former classmate Kurosu is significant for the character and the film's portrait of modern Japan – a male peer and confidant with whom he can discuss his situation in a way that he feels he cannot with his own family, he is also an indicator that Ryuhei's predicament is a far from isolated one. Unlike Ryuhei, however, Kurosu gives the (probably false) impression of taking it all in his stride, programming his mobile phone to ring at regular intervals so he can fake business calls to shore up his (self-) deception. Even this adds to Ryuhei's frustration, though, when to make himself look important in front of his wife, Kurosu gently admonishes his friend for clerical errors that he cheerfully claims to have just covered for. For a low key drama, Tôkyô Sonata is dense in its detail, both literal and suggestive. It's heavily implied but never explicitly spelt out, for example, that Kenji's decision to take up the piano is based on a fascination with female teacher Kaneko, but it is never clarified whether this is the result of a schoolboy crush or a previously unrealised longing for a surrogate mother. That Kaneko is in the midst of a troublesome divorce is a further reflection of the broken family theme at the film's heart. In a similarly suggestive vein, no direct comment is made on the fact that visiting executive Shao, whose advice may or may not have contributed to Ryuhei's redundancy, is young and female, at least beyond Ryuhei's own disconcerted glances. Given the emasculative aspect of Ryuhei's fate, it seems likely that her age and gender were a deliberate choice on the director's part. The film marks an unexpected style switch for director Kurosawa Kiyoshi, whose superb early urban horror thrillers Cure (Kyua, 1997) and Pulse (Kairo, 2001) have in recent years given way to less tightly focussed works such as Bright Future (Akarui mirai, 2003) and Doppelganger (Dopperugengâ, 2003). Although not a genre piece in the vein of the earlier films, Tôkyô Sonata does recapture the sense of dislocation and loneliness that were key to their unsettling effectiveness. The Japanese society it portrays is not one of harmonious unity but of individuals who feel isolated even in the company of others and who appear to have lost the ability to effectively communicate on a personal level. It's a picture painted with compelling subtlety and convincing naturalism by filmmakers and cast alike – the perpetually browbeaten Kagawa Teruyuki in particular make Ryuhei, in spite of his frustrated busts of anger and seeming inability to appreciate the needs and feelings of those close to him, a figure worthy of pity and sympathy, while the crumbling of the family unit and the build to personal confrontations are as tense and emotionally affecting as anything in Kurosawa's oeuvre. The only disruption to this storytelling harmony occurs about two-thirds of the way in following a climactic confrontation between Ryuhei, Megumi and Kenji, when the film takes a brief but unexpected detour into black comedy, as Megumi is kidnapped by a manic-depressive burglar, played with exaggerated agitation by Kurosawa regular Yakusho Kôji. Intriguing and character-relevant in itself, this does jar a little with the soberly observational drama that precedes it, the style shift emphasised by a one-off break with the previously linear storytelling. It's a turning point for the narrative in which the crisis factor is upped considerably for both Megumi and Ryuhei and both are steered towards fates that seem a little too easy in their dramatic inevitability. Pleasingly, for the characters and for the film, Kurosawa clearly believes that even in a family's darkest hour, doors to potential emotional reunification are never completely closed. Tôkyô Sonata arrives on the UK on the back of a wave of critical plaudits and a Cannes award win, and in spite of its late story dramatic sidestep, one that I admit appears to have bothered few others, this positive reaction is fully justified. Kurosawa's economy of storytelling and attention to detail ensure that not a single scene passes, no matter how short, without expanding in some way on our understanding of the characters and their situation, and in a manner that invites the sort of analysis and appreciation there just isn't room for here. There's a sizeable paragraph's worth of discussion in the various small humiliations that come with Ryuhei's cleaning job, for instance, or in Ryuhei's discovery of an envelope of money, Kenji's attempt to run away with a school friend and the whole issue of young Japanese serving in the American military (a situation invented by the filmmakers but in the belief that were this really possible, many would sign up). Precious few Japanese live-action features appear to have found a UK cinema release in the past two or three years, and only a couple of weeks back I asked a visiting Japanese friend to recommend some current worthy titles for me to hunt out. He shook his head and mournfully told me, "Unfortunately there are no good Japanese films at the moment." I can't help but suspect he would have expressed a very different view had he seen Tôkyô Sonata, a film that explores the shifting nature of society and family with a rare and compelling blend of humanity, honesty and cinematic understatement. 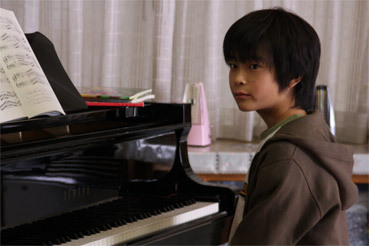 Tokyo Sonata will be released in UK cinemas on 30th January 2009 by Eureka Entertainment.